Founded in 1850, Temple Beth El is the oldest Jewish congregation in Michigan. 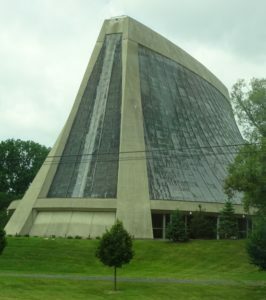 It’s two previous buildings are listed on the National Register of Historic Places, but in time the congregation had moved out of the city necessitating the opening of a new Temple in 1973 in nearby Bloomfield Hills. 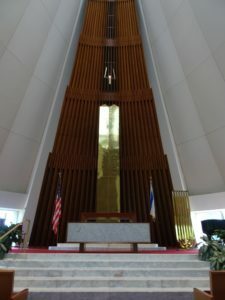 Temple Beth El was designed by the great modern architect, Minoru Yamasaki, who also designed the original twin towers of the World Trade Centre. The Temple and the WTC were designed at approximately the same time and it is said their models were constructed side by side. As a result there are those who look for signs of the former twin towers of the WTC in Temple Sinai and indeed the Ark containing the scrolls bears some similarity. However the inspiration for the building is clearly drawn from the Hebrew scriptures. The wonderfully bright airy feel of the space is achieved with the two side walls which appear to be made of 100 canvas like panels on each side covering the exterior glass as it rises to enormous heights. 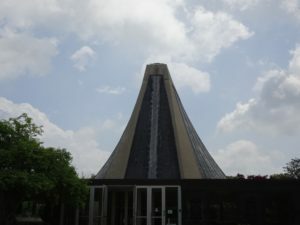 But rather than meet at the top the two sides are separated by forty panels of glass forming a skylight the length of the sanctuary that brings additional light into the space. At ground level the first 8 feet of the sides is clear glass giving a panoramic view of the beautiful park like setting. It is a wonderful inviting and inspiring space. “What does it mean?” I asked Rabbi Mark Miller as we engaged in a conversation about the space. The forty panels in the ceiling are one clue as they correspond with the number of years Israel spent in the wilderness between slavery in Egypt and entry in the promised land. During the wilderness years, Israel lived in a tabernacle or temporary shelter in the wilderness. The great sides of the Temple are meant to invoke a tent like feel in the sanctuary to remind the worshippers they are pilgrims on a faith journey with God. The floor level clear glass exposing the park like setting is to represent the manner in which the canvas would be rolled up in the wilderness and to remind the people that the faith journey is not simply a vertical relationship with the Creator above, but also with the world around. The park like setting so visible through the floor level glass is undoubtedly also a reminder that when God finished the work of creation, God saw that it was good. 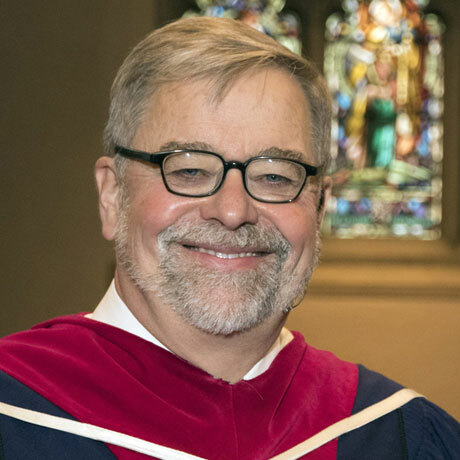 In a world where there is so much bad news, the sanctuary of Beth El invites the pilgrim to look out and rediscover the goodness of God’s world and to lets its beauty speak into our faith. One of our pilgrims asked Rabbi Miller the meaning of Beth-El. In the Genesis chapter twenty-eight, Bethel was the place of encampment for Jacob as he fled his family having deceived his father to obtain his brother’s blessing. The only pillow he could find was a rock, but in the night he dreamt of a ladder reaching from earth to heaven and saw angels ascending and descending upon it and then suddenly the Lord was with him and renewed his covenant. Jacob anointed the rock on which he slept, made a vow to God and said, “Surely the Lord is in this place and I did not know it. How awesome is this place. This is none other than the House of God and the gate of Heaven.” Beth-el, means the House of God and by naming the Temple Beth-El the worshipper is called to be ever open to the presence of God, even when God seems distant and silent. “Okay,” I said to Rabbi Miller, “But what about the one hundred panels on each side of the tent?” He then took us back to Deuteronomy 10:12 which is the root of a Jewish tradition that every day we should number or offer at least 100 blessings. In other words we should stop 100 times a day to give thanks to God. In a world where instant gratification is the norm and impatience leads to constant complaining it is wisdom that will say, “Stop every ten minutes and reflect on what you are thankful for and offer a blessing.” On a bad night with nothing but a rock for a pillow, Jacob had been awakened by a dream to the reality of God’s presence and the wonder of his blessings. It was only later when looking back at some of my photos, I realized that from the back the Sanctuary of Beth El might also be interpreted as two warm and inviting outstretched wings poised to welcome the pilgrim to the safety of the nest. I thought too of the Mariner’s Church which through the years had been referred to as the Sailer’s Bethel. 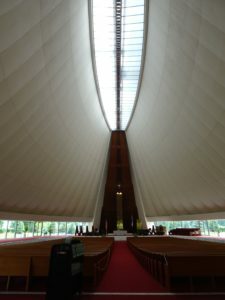 A sailer entering Temple Beth-El might well have a sense that the two high walls with their canvas panels are the sails upon the ship of faith’s voyage. 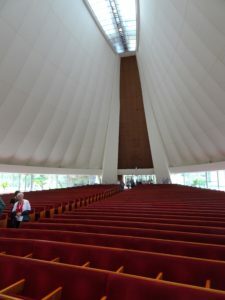 Temple Beth El is a sacred space made alive by one’s response to the invitation to journey in faith with the tent flaps raised, the sails set and the windows, hearts and minds fully open to the beauty and mystery of God’s abiding presence and amazing grace.